Yield forecasting is essential for management of the food and agriculture economic growth of a country. Artificial Neural Network (ANN) based models have been used widely to make precise and realistic forecasts, especially for the nonlinear and complicated problems like crop yield prediction, biomass change detection and crop evapo-transpiration examination. In the present study, various parameters viz. 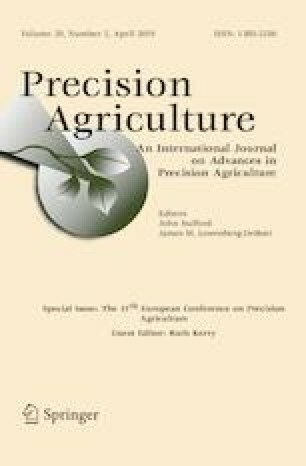 spectral bands of Landsat 8 OLI (Operational Land Imager) satellite data and derived spectral indices along with field inventory data were evaluated for Mentha crop biomass estimation using ANN technique of Multilayer Perceptron. The estimated biomass showed a good relationship (R2 = 0.762 and root mean square error (RMSE) = 2.74 t/ha) with field-measured biomass. The present work was carried out as a part of Council of Scientific and Industrial Research Network Project (BSC 0203). The authors wish to acknowledge Director CSIR-Central Institute of Medicinal and Aromatic Plants for providing support to carry out the research work. Authors are also thankful to the anonymous reviewers for their careful reading of the manuscript and insightful suggestions. Srivastava, R. (2013). The mint that grows profits for farmers! The Hindustan Times, 29 April 2013. Retrieved March, 2018 from https://www.hindustantimes.com/lucknow/the-mint-that-grows-profits-for-farmers/story-aeaOnQL9NAHjwJb18gJbLM.html.